I’ve rewritten the first sentence of this blog post four times…Despite being pulled out of bed to write with a heart pounding full of purpose, I still have an incessant compulsion to edit and perfect the words that you, my reader, will see. I haven’t been able to write in a long time. The creative constipation I’ve wrestled with has affected me in a few surprising ways. I believe it has affected my ability to write anything well, even case notes for work. I do not post on social media as much as I used to. Occasionally my children say something cute and I type it out to share with friends and family on Facebook. Quoting my children requires very little exercise of my abilities. They provide all the words and I struggle with the hashtags. I receive messages from people saying that they miss my posts and I send back emojis and words of gratitude. I nearly stopped requesting friends on Facebook. I may have told myself that I don’t want to know what people think in regards to politics or religion…the truth is, I don’t want to know what they think about me. One of the things I noticed this summer is that once you find a popular profile pic you can use it more than once and accumulate a lot of “likes”…it is interesting to see who has unfriended you since liking your picture when you originally posted it. I’ve had discussions over whether Facebook is a game. I’ve decided that it is, and some of us take the game too seriously. 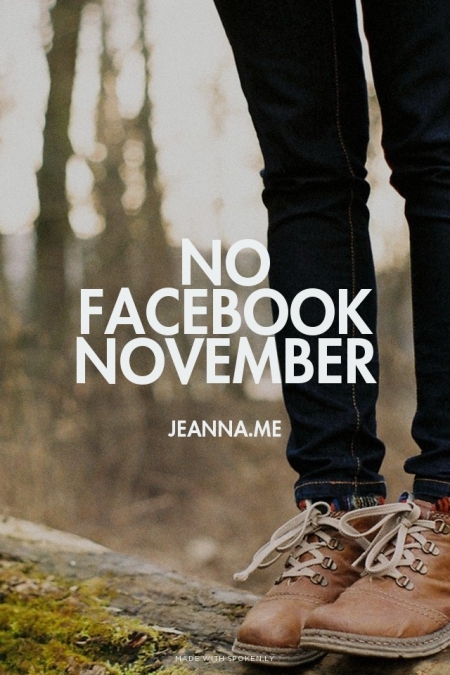 As I type this on October 17, 2015, I am aware that November approaches soon…I’ve wavered back and forth on whether or not I would attempt another Facebook detox this November. As I have posted less frequently this year, I wondered if it would even be considered a worthwhile effort. My birthday approaches, a social media favorite. I certainly wouldn’t want to miss out on Facebook that day. It is nice of Facebook to gather everyone together for a party on my timeline. Last year I believe I had nearly one hundred blessings sent to me online. I remember that I spent that same evening with just one friend watching the Royals in a very empty room. I was sad for my friend because she had hoped her friends would come hang out with her and watch the game. If you set out snacks they will come…well it didn’t happen that way. I was just there to support her on a night when I didn’t have plans…that also happened to be my birthday. The Royals lost. Birthdays are just days, except on Facebook where everyone has time to spend…Quite a few years ago on my birthday I had blocked everyone’s ability to post on my timeline and panicked when I started only receiving private messages and not public posts. Years before that–it wasn’t even an issue. At least this year my birthday has the additional novelty of being Back the Future day. I just want a hover board…and sustainable fuel options at the pump…It’s time. What drove me out of bed to write was the acknowledgement that I do actually have a social media problem. Last weekend I had the pleasure of listening to Robert Madu speak about the Danger of Comparison in front of almost 8,700 women at the Designed for Life Conference in Springfield, Missouri. When he was going on about online comparisons with his trope “but me” I was happy to think to myself…”not me”…until he hit a chord with a little rhyme about Instagram…Something like, “Instagram, Instagram, tell me who I really am…” Well, that stung a little. Instagram was my little safe place where I still felt creative…Throw a hashtag on a beautiful picture and even strangers will make a heart appear on what you have crafted with the tap of a thumb. Strangers, musicians, my favorite authors and artists…I really LOVE affirmations from people that I believe are more talented than me. I’ve collected affirmations on Instagram, twitter, Facebook, and even went as far to joke that Facebook affirmations are my love language. Yeah…I’m aware, I have issues. What I find humorous about this whole situation is that I really do have people who love me. Quite a few people, actually, and they are all amazing in the ways that they demonstrate that love. What I find absolutely captivating everyday is that I am loved by One who calls to me, relentlessly pursuing me like I’m His favorite Instagram follow. I’m going to follow the nudge that I should detox from social media in November. It’s a thing. I think it’s just what I do. I like to quit things, occasionally, at least until I quit quitting them. I’ve learned from Kyle Idleman, in his book, Gods at War, that idols do not just get cast down, they get replaced. Idols must be replaced. I’m looking forward to replacing screen time with something a little different, more personal, more relationship. For the past month and a half I’ve followed nudges on many adventures and I’ve only shared the depths of those experiences with small audiences, and somehow, for right now, that seems so right. It is my prayer that the adventure continues that fear continues to be replaced by faith and Love. If you’d like to unite with me for the Facebook Fast/Social Media Detox of 2015, I’ve left some photos below. I will use them as my profile pictures and cover photos. I hope to publish at least one more blog about the detox before November. This scares me, so I’m going to do it. My Instagram app keeps crashing on my phone…my internal reaction and thoughts taught me a lot tonight. I’m really going to miss Facebook Messenger…I use it a lot to contact my sisters and send funny gifs. I have some important stuff that I need to write. For the first time in months, I think I might be able to do it. It’s almost 3 a.m. and I have to get up early on a Saturday, today, actually–this is what writing is like, I remember. I’m doing some cool stuff in November…and I’m a little bummed that I won’t be posting about it…that I’ll just be living it. Actually…I’m not bummed about that…this is going to be good. For a reflection on my success last year check out Fast Flash Back: A Social Media Detox in Retrospect and my original No Facebook November challenge. I only had 3 days to prepare last time, I think that actually helped. 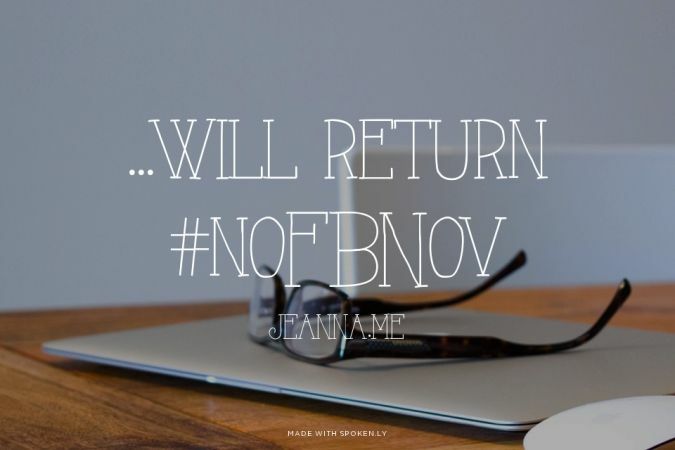 Sorry I won’t see you on FB n Nov because I worry about you..but I understand…on the other side..it’s kinda my lifeline now since I am not around friends and family….I hope you can write again because I miss your articles…love you gf…and may you be Blessed in your journey!!! Jeanna, You are an inspiration and You are one of those talented ones. Go get em!